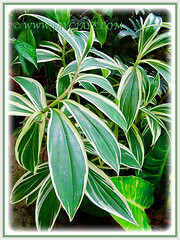 Variegated Crepe Ginger has marvellous variegated green leaves that are streaked with creamy to white stripes. A free-flowering clustering plant with tall reed-like and spiral-shaped stems. The stems are topped with large snowy-white and crepe-textured flowers on terminal cones. An amazing and spectacular flowering plant to add to one’s garden. 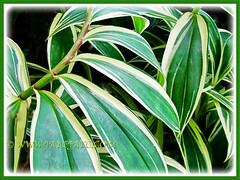 Common Names: Variegated Crepe Ginger, Variegated Spiral Ginger, Variegated Spiral Flag. Etymology: Costus is derived from the Latin name for an oriental aromatic root. The species epithet speciosus in Latin means good-looking, beautiful and impressive, describing its appearance. 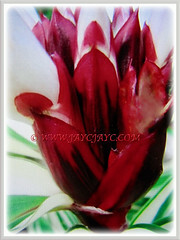 Origin: Native to Malaysia and Southeast Asia. It is widely cultivated worldwide. Plant type: An ornamental, herbaceous and perennial plant. Features: Costus speciosus, a popular species among 80-100 species of flowering plants in the genus Costus. 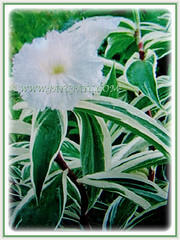 Costus speciosus ‘Variegatus’ is a variegated cultivar with marvellous leaves in bright green and creamy white. With a moderate growth rate, this erect, evergreen and perennial herb reproduces vegetatively by underground rhizomes and easily forms a dense clump of cane-like stems, 1.5-2 m in height. The clustering and leafy stems, green to reddish-brown in colour, are upright and unbranched, and some may occasionally contort into a lovely spiral pattern at the top-end. 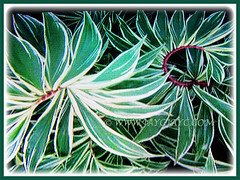 The evergreen, sessile and variegated green leaves are simple and entire, elliptic to oblong, 15-30 cm long and with pointed tips. Each leaf has a narrow white strip along the margin and white streaks randomly on the blade. The underside of the leaves is silky-pubescent. The leaves alternate in a spiralling fashion around the reddish-brown stems. More dramatic are its captivating snowy-white and trumpet-shaped flowers. Each stem will produce a brownish-red cone-like terminal inflorescence, where large and showy flowers, usually 3-4 at a time, emerge from the ovate bracts. 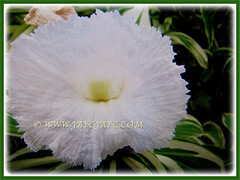 Each trumpet-shaped, frilly and crepe-like white flower, up to 10 cm in diameter, has fused petals forming a large petaloid labellum and exposing a tiny, yellow, petal-like stamen with reflexed tip at the opening of the floral tube. The delicate flowers seem as if made from crepe paper, hence aptly given the common name, Crepe Ginger. It flowers freely throughout the year in the tropics. The flowers are followed eventually by roundish to ovoid, red 3-angled fruit capsules, 1.5 cm across, containing black seeds and white flesh that are favoured by birds. 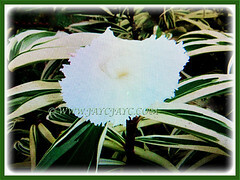 Culture (Care): Costus speciosus ‘Variegatus’ grows easily with minimum care. Light: Best in filtered sunlight or semi-shade. It can tolerate full sun but leaves can be scorched. Moisture: Moderate water requirement. Water regularly and moderately, especially during the dry season. Soil: Prefers fertile, loamy, moist and well-drained soils. 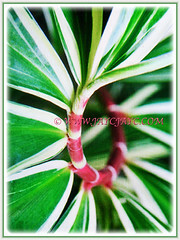 Others: Prune canes of Variegated Spiral Ginger to control sized as required. Deadhead and cut off withered leaves to keep it aesthetically pleasing. Feed once monthly with a balanced fertilizer during the growing season. Sometimes the cane-like stems may need staking due to the heavy weight above. Generally it is pest and disease free. Nevertheless, do watch out chewing/sucking insects, red spider mites and nematodes. In more northern zones, Costus speciosus ‘Variegatus’ may loose its leaves or die to the ground in winter but promptly resurface when the weather warms up in spring. However, best to protect it from heavy frost or overwinter indoors with reduced water. Leaves are seasonally deciduous in cold regions. It flowers from late summer to early fall. Propagation: Propagate by division of the clumps, stem cuttings or from pieces of its rhizome. Alternatively, by separating the plantlets that form below the flower heads. Learn how-to propagate Crepe Ginger (C. speciosus) here. Usage: Costus speciosus ‘Variegatus’ or Variegated Spiral Ginger will make an excellent ornamental specimen for the garden or landscape. Grown en masse, they’ll be ideal as a tropical backdrop in perennial borders or as informal hedge and screen. It’s lovely too as a container grown feature plant at patio and deck. 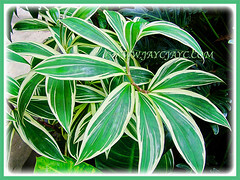 Suitable to be grown in a raised planter as an accent plant with a tropical theme. 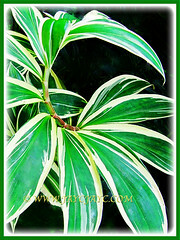 Grow this spectacular variegated beauty as a backdrop amongst other non-variegated ones for a lovely contrast. It is cultivated in various regions worldwide for its traditional medicine. The plant’s rhizomes, leaves and stems have different health functions and are used accordingly to treat fever, dysentery, bronchial asthma, pneumonia, rheumatism and inflammation, to name a few.